Nationalist lawmakers in Greenland appear ready to let the government crash and burn rather than let Danish money help make Greenland’s largest-ever infrastructure project a reality. As a self-governing country within the Kingdom of Denmark, Greenland receives nearly 4 billion kroner ($620 million) each year from Copenhagen in the form of a block grant. Ever since 2009, when Nuuk was granted more powers to manage its own affairs, this has been the only money Danish lawmakers have sent to Nuuk. Ironically, the practice of not sending more money satisfies both those lawmakers in Copenhagen who would prefer that Denmark not let the country drift too far, and those in Greenland who believe it should make due with less, not more, Danish money. This equilibrium may change in the coming week: Lars Løkke Rasmussen, the Danish PM, is scheduled to call on Nuuk on Monday to discuss whether Copenhagen will chip in to help Nuuk fund a 3.5 billion kroner airport-construction project. 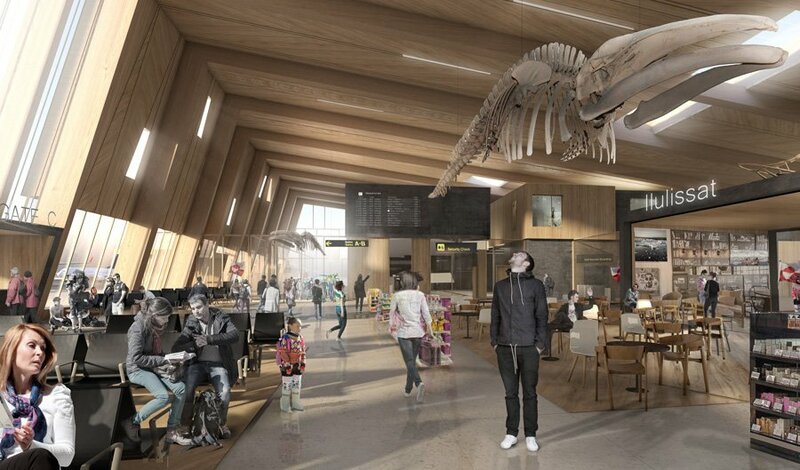 The plan, to which Greenland’s national assembly has yet to grant final approval, calls for runway extensions and terminal improvements in Nuuk and Ilulissat. Currently, both airports have runways measuring 800 meters — just long enough for 40-seat turboprops to take off and land. Lengthening the runways to 2,200 meters would make it possible for the airports at the country’s two main destinations to receive intercontinental airliners. An entirely new airport where regional jets can take off and land would also be built in Qaqortoq, in the extreme south. If passed, the project would be the largest in Greenland’s history — and, when taking the size of the two economies into account, 17 times the size of Denmark’s largest-ever infrastructure project, according one estimate. Supporters of the plan recognise that the cost makes it a long-term burden, but they argue that it is a worthwhile investment, since the longer runways would make making it easier and, they hope, less expensive, to travel to Greenland. Opponents’ objections run the gamut, from cost (with some suggesting that a cheaper upgrade of existing facilities would have nearly the same effect) to the impact of closing the two airports which the project will render obsolete. Such concerns have slowed but not stopped the project’s progress: Kalaallit Airports, the company set up in 2016, to build, own and operate the airports, is prepared to ask six firms to bid on work extending the runways in Nuuk and Ilulissat. It had planned to do so this spring, but postponed doing so until after the national assembly gave the project its final approval, thus committing Nuuk to paying for half of their construction. Where the other half would come from has always been uncertain. Kalaallit Airports has said it can cover part of the needed funding by taking a loan of up to 1.5 billion kroner. The rest will need come from an investor — but the more it collects in investments, the less it will need to borrow, it underscores. Copenhagen has repeatedly — and unsuccessfully — offered to pony up with some of the funding, and, in so doing, provide what it says is a measure of certainty for a project that — succeed or fail — will have a “long-term and irreversible” impact on Greenland, according to a report published by an economics watchdog group in May. This is also a message Rasmussen harps on when he addresses the matter of Danish involvement. Negotiations begun around that time between officials from the two countries seemed to indicate that Nuuk had reached out, at least. Now they appear to have advanced so far that a deal, which would see Copenhagen contribute a nine-figure sum and purchase some of the shares in the airport, is ready to be signed. Whether Rasmussen, in fact, makes the trip to Nuuk tomorrow may depend on whether Kim Kielsen, Greenland’s premier, can get his political house in order. Rasmussen is unlikely to sign a deal that does not have the support of a majority in the national assembly. As it turns out, Kielsen will need to count on the opposition to provide him with the needed backing. The prospect of receiving Danish funding — and in the processes downgrading Greenland from being “sole” to “majority” owner of a cornerstone of the country’s economic future — has consistently been rejected by the nationalists in Kielsen’s coalition. Ruling out any chance of accepting Rasmussen’s offer, even before all the terms are known, places Kielsen in a bind: ̵osing their support would put his government in the minority, but without Danish funding, the airports may never get built. A deal could still be secured, and by a wide margin, if the opposition choses throw Kielsen a lifeline. It has said it will do so, but only if certain conditions are met. Kielsen has in the past led a unity coalition that included his main political rivals, so a deal with them that lands the airport deal is not unthinkable. Getting his government off the ground again afterwards might prove a somewhat more challenging task, however. September 10 is World Suicide Prevention Day. Suicide is a global problem. Each year, nearly a million people take their own lives. Among young people (aged 15-29) it is the second leading cause of death. The problem is pronounced in the Arctic. Programs to prevent suicide, particularly among young men, have helped treat the symptom, but this has exposed a root cause that needs acute care: In regions that have a seen a decline in suicide, some report a rise in threatened or attempted suicides. According to the WHO, the UN’s health organization, a prior suicide attempt is the single most important risk factor for suicide in the general population. An ounce of prevention, it would seem, is worth nothing unless it is followed up by a pound of cure. On September 10 and 11, the Finnish Ministry of Agriculture and Forestry hosts the first Arctic Resilience Forum. The event, being held under the auspices of Helsinki’s Arctic Council chairmanship, will focus on how the region can cope with the changes brought on by a warming climate. Canada’s national inquiry into missing and murdered indigenous women and girls (MMIWG) holds its second round of meetings in Nunavut from September 10 to 13. Unlike the first gathering, in Rankin Inlet, in February, which heard testimony from family members, the coming week’s gathering will addresses the theme of socio-economic, health and wellness impacts of violence against indigenous women. Officially titled a Knowledge Keeper, Expert and Institutional Hearing on Colonial Violence session, the commission will likely hear testimony from elders, social workers, academics, legal experts and others who deal first-hand with the victims of violence and their families. The Nordic Council gathers in Nuuk on September 12 and 13 to discuss how global warming has affected the Arctic, and what further changes can be expected. On September 15, NASA, the U.S. space agency, plans to launch ICESat-2, which, as the name indicates, is satellite equipped to monitor polar ice. Statistically, September 15 is the date when Arctic sea ice is most likely to reach its minimum summer extent. When this will actually happen is difficult to predict, due to sudden weather events. Even so, the range of dates is surprisingly narrow. Between 2015 and 2017, it fell on the 10th, 11th and 13th days of the month. In 2014, the most recent year it occurred after the average date, it was on September 17. One scenario for this year is that warm water surrounding sea ice in late August will move back the date when sea ice begins expanding. According to a September 4 update from the NSIDC, a Colorado-based research outfit, the seasonal decrease in sea ice extent has slowed, meaning the turning point is near, however. The good news is that sea-ice extent this year appears to be the highest since 2014. The bad news: that will still place 2018 amongst the ten lowest minimum extents recorded since 1979, when satellite monitoring began. It will also mean that the 12 lowest minimum extents were all recorded during the 12 years between 2007 and 2018.